Tagore film at Cannes – Adler & Associates Entertainment, Inc.
Cannes, May 17: Among all the movies that have been made about Rabindranath Tagore, there is one that is certainly a little different – made in 3-D, Natir Puja (The Court Dancer), a 92-minute feature film, will be premiered in Cannes tomorrow. This is a real labour of love on the part of director Karl Bardosh, an associate arts professor at New York University, who has been talking about his project for many years and will see his dream come true tomorrow. So how did Bardosh, a Hungarian who cuts an eccentric figure in a white hat, get involved with a film about Tagore? It is a long story, he says, but it is all to do with a visit Tagore made to his native land in 1926. Having arrived in Budapest on October 26 that year, Tagore fell ill. “He suffered from a heart murmur and was taken to hospital,” says Bardosh. Tagore was so moved by the treatment he received that he planted a tree outside the hospital. He did so with the words: “I am planting this tree in resemblance of my stay here, for nowhere else I was given what I received here. It was more than hospitality. It was the awakening of the feelings of kinship. I sense that I have come to the land of a nation which is emotionally akin to India”. The tree has become a symbol of Hungary-India relations. Tagore himself returned to Hungary on, at least, two other occasions and invited Hungarian scholars and artists to stay with him in Santiniketan. 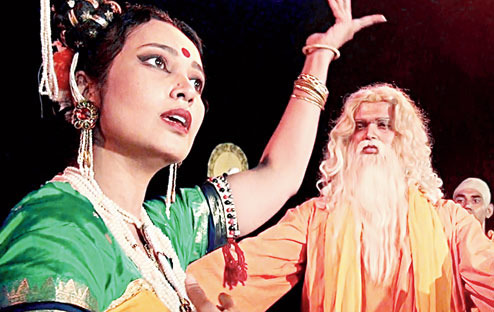 In time, Bardosh decided to recreate the only film that Tagore made – Natir Puja in 1932 – but the work was lost in a fire in a Tollygunge studio. Bardosh travelled to Calcutta and shot the film, much as Tagore had done, using local dancers and musicians. But after seeing a 3-D film about a German dancer called Pina Bausch, Bardosh said “I decided to make my film in 3-D as well”.